The South Limón fold-and-thrust belt, in the back-arc area of southern Costa Rica, is characterized by a 90° curvature of the strike of the thrust planes and is therefore a natural laboratory for the analysis of curved orogens. The analysis of curved fold-and-thrust belts is a challenge because of the varying structural orientations within the belt. Based on seismic reflection lines, we created a 3-D subsurface model containing three major thrust faults and three stratigraphic horizons. 3-D kinematic retro-deformation modeling was carried out to analyze the spatial evolution of the fold-and-thrust belt. The maximum amount of displacement on each of the faults is (from hinterland to foreland); thrust 1: 800 m; thrust 2: 600 m; thrust 3: 250 m. The model was restored sequentially to its pre-deformational state. The strain history of the stratigraphic horizons in the model was calculated at every step. This shows that the internal strain pattern has an abrupt change at the orogenic bend. Contractional strain occurs in the forelimbs of the hanging-wall anticlines, while a zone of dilative strain spreads from the anticline crests to the backlimbs. The modeling shows that a NNE-directed transport direction best explains the structural evolution of the bend. This would require a left-lateral strike-slip zone in the North to compensate for the movement and thereby decoupling the South Limón fold-and-thrust belt from northern Costa Rica. Therefore, our modeling supports the presence of the Trans-Isthmic fault system, at least during the Plio-Pleistocene. Affolter, T., and Gratier, J.-P. (2004), Map view retrodeformation of an arcuate fold-and thrust belt: The Jura case, Journal of Geophysical Research 108, B03404. doi: 10.1029/2002JB002270. Brandes, C., Astorga, A., Blisniuk, P., Littke, R., and Winsemann, J. 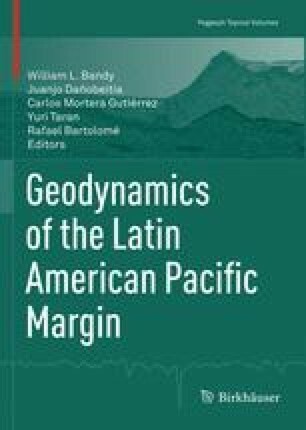 (2007), Anatomy of anticlines, piggy-back basins and growth strata: a case study from the Limón Fold-and-thrust belt, Costa Rica. In: Nichols, G., Williams, E., and Paola, C. (eds) Sedimentary Processes, Environments and Basins: A Tribute to Peter Friend, IAS Special Publication 38, pp. 91–110, Blackwell Science, Oxford. doi: 10.1002/9781444304411.ch5. DePaor, D.G. (1988), Balanced section in thrust belts part 1: construction, AAPG Bulletin 72, 73–90. doi: 10.1306/703C81CD-1707-11D7-8645000102C1865D. Fernandez Arce, M. (1996), Evaluacion del hipotetico sistema de falla transcurrente este-oeste de Costa Rica, Rev. Geol. Amér. Central. 19/20, 57–74. doi: 10.15517/rgac.v0i19-20.8626. Gutiérrez-Alonso, G., Johnston, S.T., Weil, A.B., Pastor-Galán, D., and Fernández-Suárez, J. (2012), Buckling an orogen: The Cantabrian Orocline, GSA Today 22, 4–8. doi: 10.1130/GSATG141A.1. Seyfried, H., Astorga, A., Amann, H., Calvo, C., Kolb, W., Schmidt, H., and Winsemann, J. (1991), Anatomy of an evolving island arc: tectonic and eustatic control in the south Central American forearc area. In: MacDonald, D.I.M. (ed.) Sedimentation, Tectonics and Eustacy: Sea-level changes at Active Margins, International Association of Sedimentologists, Special Publication 12, pp. 273–292. doi: 10.1002/9781444303896.ch13. Walther, C.H.E. (2003), The crustal structure of the Cocos Ridge of Costa Rica, Journal of Geophysical Research 108, 1–21. doi: 10.1029/2001JB000888.